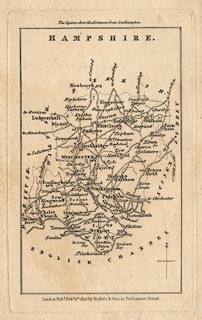 Map, uncoloured engraving, Hampshire, and the Isle of Wight, scale about 18.5 miles to 1 inch, from the Family Topographer by Samuel Tymms, published by J B Nichols and Son, 25 Parliament Street, London, 1832.
inscription:- printed -on- bottom centre London. Pubd. Feby. 1st. 1832, by Nichols & Son, 25 Parliament Street.